Genomixer By Stanza. 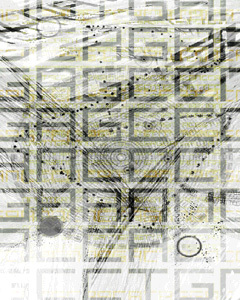 DNA sequence used as data to make artworks. .
Genomixer Geno Open Source DNA Clock Junker Hidden Values Inside.. Welcome to Genomixer where my DNA data is used to make visual artworks and sound based systems. Presented online are a series of artworks inspired by the human genome sequence and developed from DNA profiles which are sequenced from the artists blood. 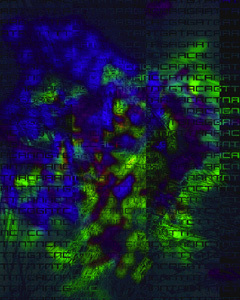 These artworks are investigations into genetic codes mapped and re assembled online. To make these works my DNA was sampled to make metaphases, g-banding and full profiles of chromosomes. After this process the the DNA was encapsulated and resides in my freezer ready for cloning. All the artworks are enabled by DNA data represented as code that has been extracted from my blood. The code is used to make audio visual self portraits and data visualisation experiences based on the building blocks of life. The Genomixer artwork enables you to mix and cross reference all the code on the genome sequence allowing you to intermix your own variable of me; you can also look at a new mix of chromosomes in real time on line. A database of dna code. A completely new online experience. Proposition. It seems likely with the advent of self DNA tests the emergence of this type of DNA testing will be prolific. This data can be recorded could be intergrated into the genomixer database and saved as an open source system. That is, each independent user will have their own personal online audio visual experience based on each unique genetic code and becuase they have the option to save it this means they can also see and listen to other users results. In other words this is a giant open source audio visual labyrinth and database. The system uses a generative audio system that can play interactive non linear audio over the net. The sounds are mapped to the genetic codes. 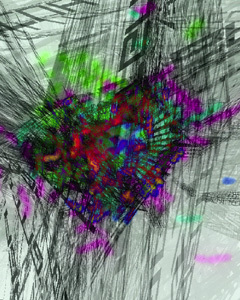 Genomixer is a complete audio visual online generative system. Code representing code generated by code made from blood. Open source DNA movement. Exploitation of the masses for the masses. The genomixer has also applied for public IPO. If any venture capitalists would like to express interest, ie investment please get in touch. The IPO will allow the database of users to be accessed by other company research and all monies derived from expostulation and investigation of our pooled DNA will be shared. If you donate a sample we will use your dna for profit and sell the information publicly for mutual benefit. Won first prize at Art in Motion (AIM V: SYZYGY the human remix) exhibition, at the Armory Center for the Arts in Pasadena, California. USA. Exhibited at and gets an honary mention at Videoformes France. 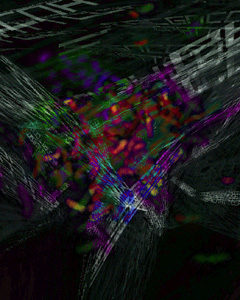 Exhibited at SIGGRAPH 2004 Electronic Art Exhibition in USA. Folly. Soundtoys Solo Show. Lancaster. UK 2005 . All images copyright. Do not reproduce or use for bogs without written permission. The copyright for any material published on this web site is reserved. Any duplication or use of objects such as images, diagrams and texts is not permitted without Stanza's written agreement. All rights reserved. (c) 2000 - 2003 Stanza.